The other part I was worried about, the gutting part — turned out to be a surprise — that part was actually really really interesting. That’s when I looked into the cavity and realized that yeah, I was totally okay. In fact, I thought it was much more interesting than it was gross. All the guts are enclosed in a membrane, so they’re like one big sac. “Look!” I said. “There’s the heart …” As if the MH hasn’t done this thousands of times in his life … There was some blood, and it was surprisingly red — like movie blood — but nothing smelled bad – the only smell was of digested grass and that wasn’t much different from being around cow or horse dung. In fact, I thought it was all very interesting in the way that when you’re a little kid you just want to see what things look like. Once the MH had gotten everything detatched, he tipped the carcass up and rolled the guts out onto the grass. Then he pulled out the liver, showed me the bile duct before carefully cutting it out. He tucked the liver and the heart into the carcass, then he dragged the antelope back to the truck (I offered to help but he said he was fine — so I trailed along like the girl). 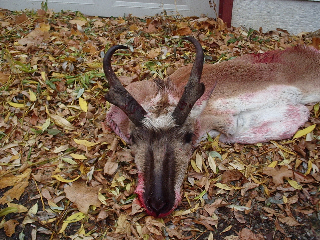 When we got back to his house, I helped him hang the antelope on the meat hooks in the garage and then he skinned it. Apparently, it’s much easier to skin when the animal is still warm, and since you want to cool it down as quickly as possible, it’s good to get it skinned out right away. Again, not icky. A little startling to think of actually pulling the skin and hide off of something, but again, I was mostly just fascinated to see the musculature revealed, and appreciative that the MH was doing this part for me (along with the gutting — it was cool to watch, but I’m not sure I’d have been as sanguine if I’d had to do it myself). It’ll hang for a while — I’m not sure how long — and then I think he’s going to butcher it for me. So that was my adventure in hunting. Over on Michael Ruhlman’s blog they‘re talking about how once in your life you should eat an animal you slaughtered yourself, so I guess I can now cross that off the list. I have to say though, I don’t feel any more what, reverential? about this antelope because I shot it than I have about all the other antelope or elk or venison that I’ve eaten that my friends have shot. But then again, the idea of eating an animal that was killed by someone I know isn’t so foreign to me. I grew up eating elk and venison and ducks that my dad and brother and Dad’s guide, Ray Kennedy hunted. I imagine that the experience of eating an animal that you or someone you know killed is probably more powerful if the only meat you’ve ever known came from the supermarket on those icky little sanitary pads. I would never have hunted an antelope on my own, but since the MH got me a tag last summer, and since he took me out and helped me, and since I really like to eat antelope (much more than venison or elk), well, I hunted an antelope. I am glad that I ordered the River Cottage Meat Book the other day though because I’m now the proud owner of an antelope heart that I have to figure out how to cook. And I have an antelope liver, so I can try the Terrine Jacquy again (or maybe I’ll just do the Pate Campagne out of Charcuterie — I did that last year and it was delicious). And in a couple of weeks I’ll have lots of antelope meat — which is delicious delicious delicious. I rather wish that you’d taken pictures, does that make me sound mawkish? Hope not! Can the antelope skin be used for anything? I just found your blog and I really enjoy it. I’m actually from that area so it’s interesting to see it through someone else’s eyes. I totally relate to your antelope experience. I’ve never had to gut one but I’ve gutted many (oh so many) chickens. It really is weirdly interesting to see just how delicate lung tissue is. And their digestive system is amazing. Wow! You make it sound so… simple. I’ve been hunting for 2 years now and am still looking to take my first big game! That’s how the cookie crumbles, I guess. No one in my family hunted and my husband started hunting at the same time as me, so the whole experience has been a revelation to me. In fact, I think it was very much part of the change in my outlook on food (I was a grocery store, meat-on-sanitary-pads person before). With respect to field dressing, deer occurred to me as antelope did to you (oooh! parts!). But the stomach in the antelope freaked me out! It was HUGE! Also, if you think it didn’t smell bad you must not have accidentally poked a pinhole in the stomach. Good God! Anyhow, I’ve been enjoying your blog very much! I live over in Helena, so it’s good to hear about other Montanans living how we’re striving to! Hi Kim — well, I had a *lot* of help. The MH has been guiding for most of his adult life — and he totally set the shot up for me — I just pulled the trigger and tried not to get a black eye from the scope. And like I said, I didn’t even gut it myself, I stood there holding one leg and looking on … so I’m hardly a “real” hunter … But I do love me some antelope and now I have a lot of it in the freezer. But I am kind of proud of myself for not wimping out. Brava for taking such a big step. If we all did this – impossible as that sounds, we’d need the opportunity as well as the bravery – we’d have a much healthier, more honest, more respectful attitude to food, I think.